Happy Tuesday! Today I’ve got a healthy grainy salad that DOES NOT taste like a cardboard box. Yeah not kidding. Not even a little cardboard like. First things first! What is going on this week?! Tonight: Pretty little liars! Yahoo! Went to this amazing little pizza place this weekend and had pizza that tasted really similar to a margarita pizza but it had fresh burrata instead of mozzarella and mmmmmm was it tasty! I think a recipe like this might be in the works for the blog next week. Thoughts?! You know what I also did on Saturday that I had never ever done?! Yes, I got what seemed like an over priced blow out but I fulfilled that slot on my glamour bucket list. Honestly and truthfully it was a really nice experience. Would I do it again? Maybe… like for a birthday or celebration. I’m kind of fussy with my hair and I’m not sure that I would pay $45 randomly to get my hair blown out. The décor in the salon was absolutely gorgeous. The branding that they have going on is on point. A+ for their marketing team. Seriously, it’s adorable. For some reason this last week I have been scarfing down quite a bit of salad. I go through a salad phase every few months and it’s seriously ALL I’ll eat for lunch. It would be pretty healthy for me if I wouldn’t put a mount of blue cheese on it every time! Ha! Which brings me to today’s recipe. I LOVE salad toppers! 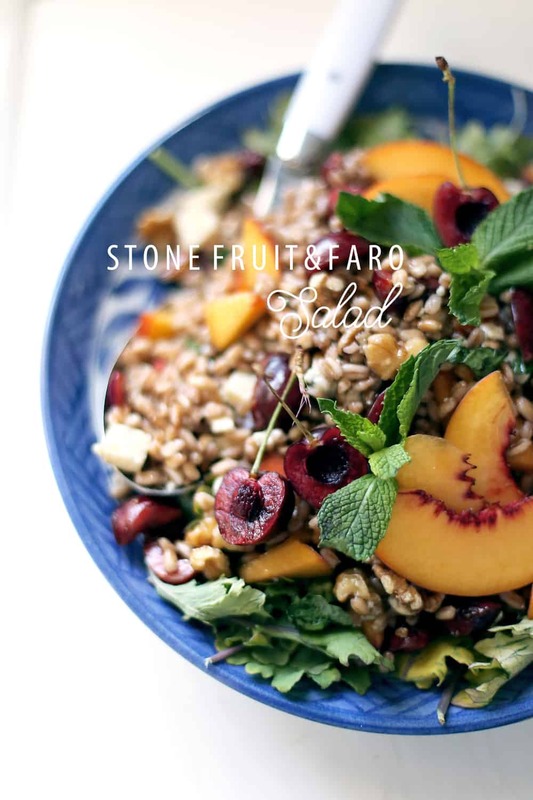 This stone fruit and faro salad today goes swimmingly on a fresh bed of spinach or kale. 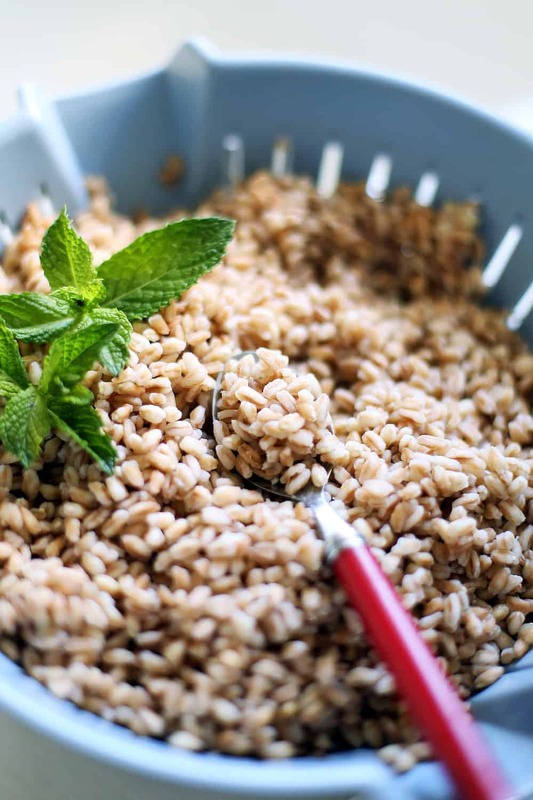 It is filled with tons of rich grains and fruity flavors. Faro is a chewier grain similar to barley but doesn’t leave you having to chew every mouthful for 30+ seconds. 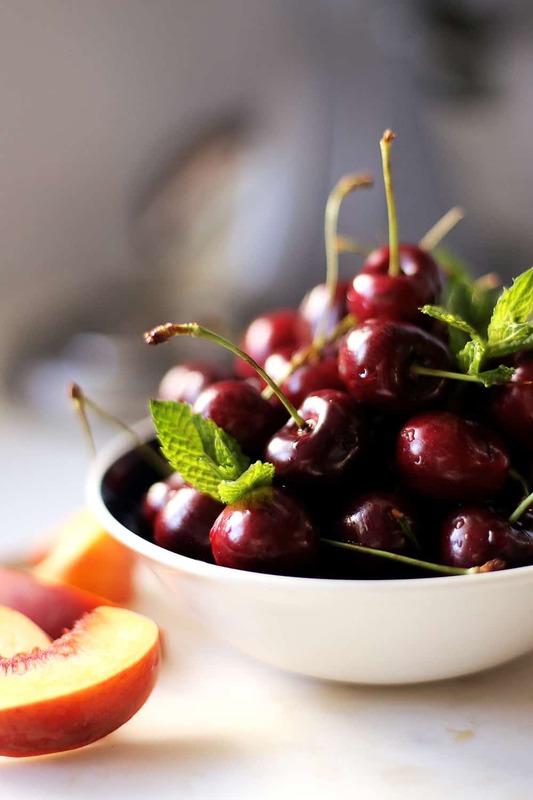 I added cherries and peaches because they are still in season for summer but this salad would be lovely with citrus segments during the wintertime. I am here to tell you to give faro a chance! If salad isn’t your deal, try it in soup! It holds up well to warm temperatures and doesn’t really get soggy, one of the many reasons why I LOVE it. 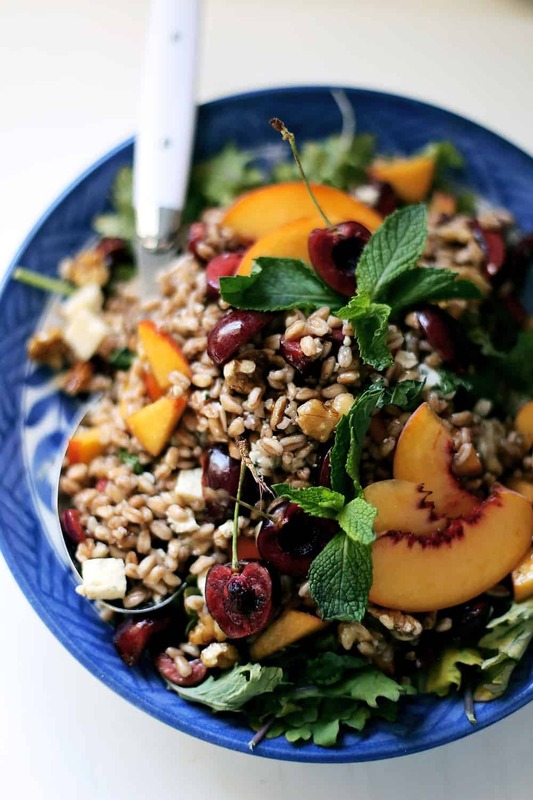 Make a big bowl and top it on your salad all week long or serve it up for a lovely dinner outside. 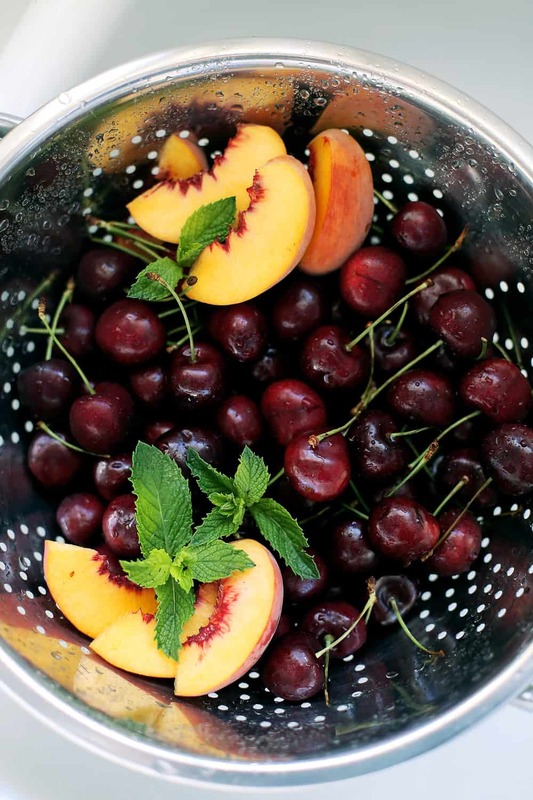 Garnish with fresh mint and peach slices. Enjoy! In a large pot fill with water ¾ full and bring to a boil. Add in Faro to boiling water and cook for ten minutes. While faro is cooking whisk together your liquid ingredients: olive oil, balsamic vinegar and honey into a small bowl and set aside. 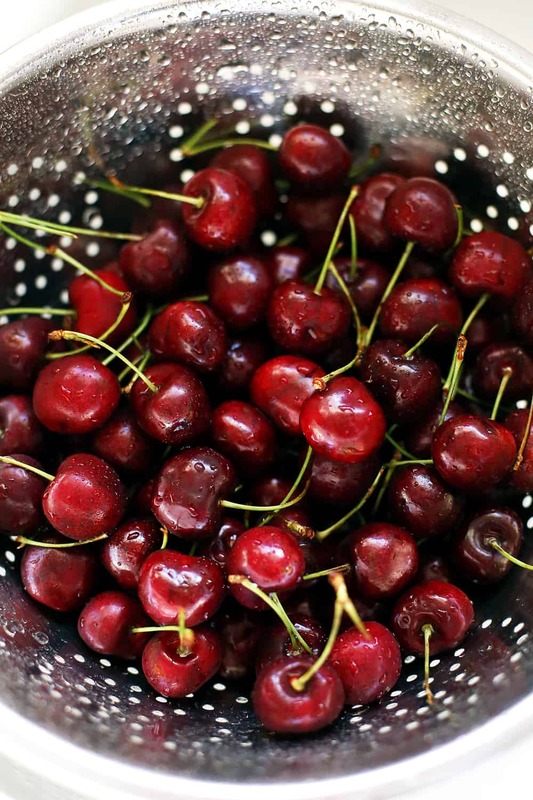 Drain into a colander and cool till room temp. 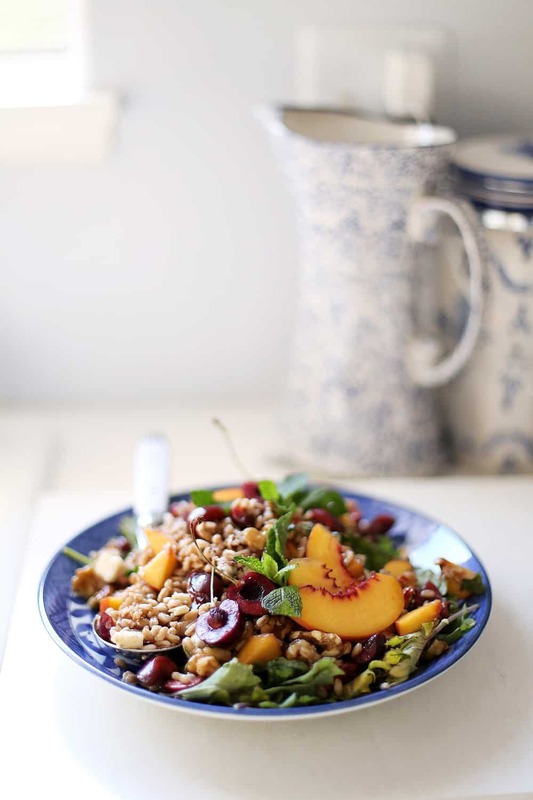 In a large bowl toss faro with peaches, cherries, walnuts, mint, Gorgonzola and salt and pepper. Toss with liquid mixture until all is coated. 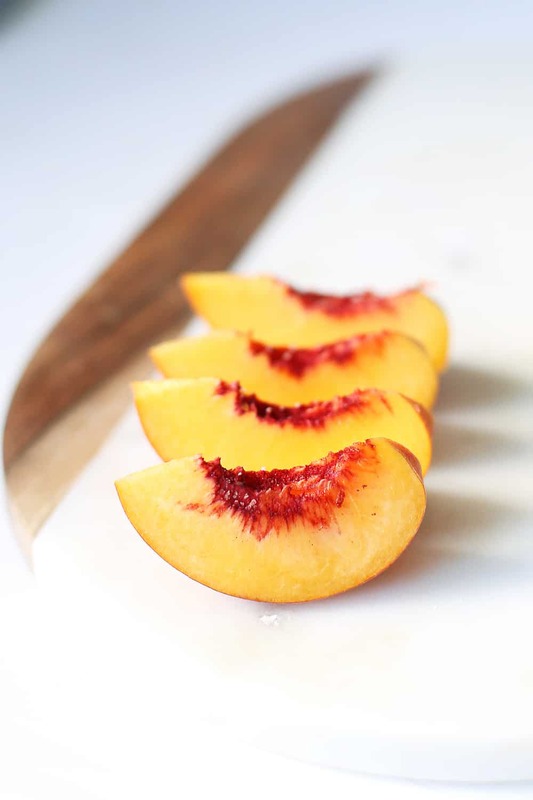 Garnish with mint lives and peach slices. That salad looks magnificent! Can’t wait to make it at home.